When on 9 April 1609 a ceasefire was signed in Antwerp, the Low Countries had been rent by warfare for forty years. On that day the Republic of the United Provinces agreed with the Royal Provinces to lay down arms for a period of twelve years. (For the sake of convenience we will call these polities the Northern and Southern Netherlands, respectively). The main proponent of the Truce was the landsadvocaat of Holland, Johan van Oldenbarnevelt, who functioned as unofficial prime minister of the Republic. In the South it was the Archdukes - Albert of Austria and his wife Isabella, daughter of Philip II of Spain - who were most strongly in favour of a cessation of hostilities. Getting to this point had not been easy. The Spanish crown considered it a loss of authority and prestige to negotiate with rebels, while in the Republic both military leaders, Prince Maurice of Orange and William Louis of Nassau, were opposed to a ceasefire. Each side moreover thoroughly distrusted the other. The first talks were undertaken on the initiative of Albert of Austria, who in 1607 sent his confessor, Father Jan Neyen on a top-secret mission to The Hague. 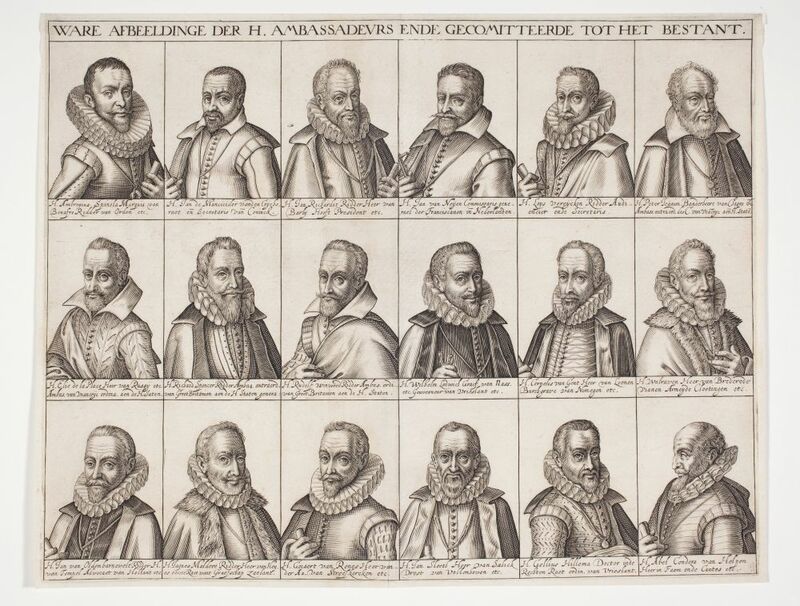 Subsequent meetings were held in Rijswijk, Holland, between Ambrogio Spinola, the military commander of the Royal Provinces, and deputies of the Republic, including representative of all seven provinces. Nominally the Dutch delegation was led by Count William Louis, but it was Oldenbarnevelt who was really calling the shots. In the end, financial considerations prevailed over issues of statecraft and warfare. The treasuries of both countries were exhausted, a situation that was particularly aggravating in Holland, which relied so heavily on commerce. Twelve years of truce were considered the minimum to allow both parts of the country, North and South, to recover financial health. The print shows Spinola at the upper left, followed by the Spaniard Mancicidor and the high representatives of the Royal Provinces. Next are the intermediaries between the two parties, the ambassadors of France and England. Particularly important in this role were Pierre Jeannin, who drafted the text of the Truce, and Ralph Winwood. To the right are the representatives of the Republic, under William Louis. The delegations are shown in hierarchic order. First comes the duchy of Guelders, then the counties of Holland and Zeeland, with the other provinces bringing up the rear. More information can be found on our website Dutch Revolt.